This is a follow-up post. If you missed the first one, find it here! Should I really fold all of my clothes? Won’t that take too much time? Does it really work? My answer to this question is a resounding YES. Even after reading the book and seeing her photos, I did not believe that a shirt or pair of socks would stand up on its own just because of the way you fold it – until I tried it for myself. Remember how the Japanese are famous for doing origami? Do I need to say anything else? I think you can trust the Japanese to know how to fold something. Spark Joy, the companion book, has a whole chapter with tons of pictures just to teach you how to fold your clothes. You can do it, and it’s easy! When I started folding a few shirts, I was amazed at how fun it was. My clothes looked so nice, pretty, neat, and compact sitting there in a pile. And they stood up on their own! Putting them in the drawer was just as exciting – I had SO much extra room in my drawer, and I could organize everything by color and type. 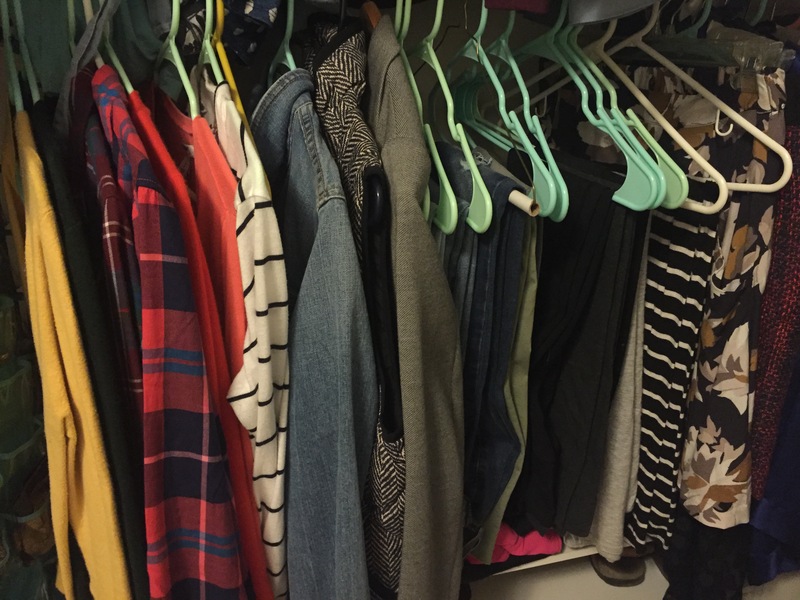 I love that it’s easy to reach for the shirt I have in mind, I don’t forget about clothes that are tucked away under piles, and when I grab something the others stay put. It’s an awesome system and I can testify that folding will bring you joy. Now, the only qualm I have with folding is that I am a little bit more lazy about putting laundry away because I know I’m going to have to fold everything, but it is worth it! Honestly, I love folding my shirts and pants – in the mornings, I’ll actually put away my pajamas instead of just throwing them on the floor. They are much neater and happier in their drawer all folded up. But, it’s definitely more tedious folding underwear and socks than it would be to just pile them or throw them in the drawer. One thing I would like to do to help with this is get some drawer organizers. Right now my socks are in a drawer much deeper than is needed, and my undies are in a really shallow drawer. I will say, though, that it’s SO fun having my underwear arranged like a store display! Choosing what to wear in the morning is so much more joy-filled now. See what else you can fit in your current drawers! Once I started putting away my clothes, I realized that my stuff now takes up a LOT less room. One of the things Marie recommends is to keep all seasonal items in your room, instead of in storage. After clearing out a tote or two from all the discarding I did, my goal became to not have ANYTHING in storage in totes downstairs. We have so many totes and there’s only two of us! I don’t want to be burdened by having to keep track of a lot of STUFF. So, I brought up all of my off-season clothes, and guess what?? They ALL fit in my dresser!! I had an entire drawer left over, so I filled it with the off-season things! My drawers are a little stuffed, especially now that I’ve made a few more purchases, but it feels so freeing to know I don’t have a whole bunch more clothes somewhere forgotten about. Additionally, I got rid of a few bags and put the rest in an empty drawer in my lingerie chest. My hats are on a shelf in my closet, and my shoes are either in the shoe rack or under the bed. And that is everything I own, clothes-wise! Amazing! It feels great to have less, and be more organized, with just a few simple steps. Once you have tidied, you will have such a better sense of what brings you joy and what doesn’t. One thing that I have taken into account when I go clothes-shopping now is the quality of the clothing I look for. When I tidied, a lot of the items I discarded were still things that I liked, but were no longer in good condition. Now, in addition to only purchasing pieces that I really love (i.e. there isn’t anything about the article that I don’t like – the color, fit, the way it lays, etc. ), I am more choosy about fabrics and fit. If it looks like material that will shrink, pill, or collect lint after a few wears, I try to avoid it. I’m especially being more picky about what I buy from Old Navy. Old Navy is a great option for buying new stylish items at a great price, but the t-shirts and shoes are not high quality. I’ve even noticed that certain styles of J.Crew v-necks (my FAVE) last longer than others. It’s also better to buy brand new items on clearance than gently worn items from a thrift store, because those items have already lost wear time. So, pay attention to what you love, and what will last. Have fun shopping but only bring something home if it passes the test! What other questions do you have about tidying, or the Kon-Mari method? I’d love to try to answer as best I can!